Or Nigel as I like to think of him. Either the Quality control has improved, or I got lucky, as I didn't really see any major flaws with Nigel. He was purchased by a friend as a gift (I got older recently) online and so was “selected” by GW staff, not someone in a store. Once separated from the sprue you can see the “real” flash mostly from vents, as we used to have with pewter but with the added bonus that they stick out, so you can see them, rather than those old sneaky spidery threads folded in under a hand or whatever. The material itself is very flexible, and the one downside I can foresee is that it’s very elastic. Springing back and holding its form very well. That means you will most likely need heat to deform the material. so no more quick bendy limb pose adjustments as with pewter. I assembled him without any pins, so we’ll see how he holds up. the material takes superglue very well though, so I am hopeful. I don't miss the heft as much as I thought I would, but maybe that’s because I went for a very heavy base for these wolves. Anyway he’s an awesome sculpt, with good detail on the new material, I didn't have any issues with the resin or flaws, so I find I have to say, thumbs up. 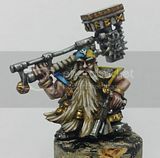 I know many peoples finecast experience has been significantly sour, so take care before you plunge in, but this is one model I look forward to painting. It is a lovely looking model, I've got the metal one and looking at that it seems as if details like the runes on armour and staff are a lot clearer on yours. I've only bought one finecast mini and it did have a few miscasts (bubbles on fine detail pieces), but nothing like some of the early examples that were shown. I hope as they get more experienced with the material they'll iron out the issues and start eradicating the issues as I think it has a lot of promise. I hope its the latter as the models do seem good casts.